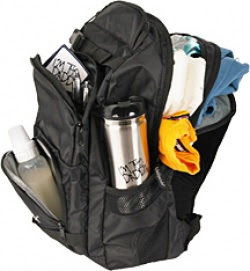 The Daddy Diaper Pack by DaddyScrubs is truly the ultimate go-to diaper bag for dads! When we received the diaper pack in the mail, I opened it and was immediately impressed with the quality. It has nice wide padded straps and the back is padded to keep dad from getting poked by toys and stuff inside the bag. As you can see from these photos, we don't have a baby anymore. My hubby said he would have loved to have a bag like this when ours were babies! It has compartments for everything you need. A place to keep your wallet and keys, a separate compartment to keep your phone safe. Two side pockets that will easily hold 16 oz water bottles. And two deep pockets for clothes, diapers, toys and and all the extras! This pack is the ultimate "daddy to be" gift! This bag is also a great addition for toddlers and preschoolers. It even has a separate compartment for wet clothes! Looking for the perfect gift for the new dad in your life? You can purchase this bag here for $69.95. Visit www.daddyscrubs.com to see all their great products. Use coupon code "BLOG13" for 10% off. Daddy Scrubs is also offering one Daddy Diaper Pack to one of my lucky readers. This looks pretty cool. My hubby might actually use it! Love the Bag o Books from their website! My husband would definitely appreciate this, and we have #3 due in July! This is a great idea! Don't have little ones, but if I did I would want one of these!